The actor: Scott Bakula may have made a name for himself on the stage before he ever earned any significant success in front of the camera, but once he made the transition, it didn’t take him long to make up for lost time, thanks in no small part to his five-season run as Sam Beckett on Quantum Leap. Bakula has continued to work steadily in television, including leading roles in Star Trek: Enterprise and Men Of A Certain Age, as well as in films like Lord Of Illusions and The Informant! 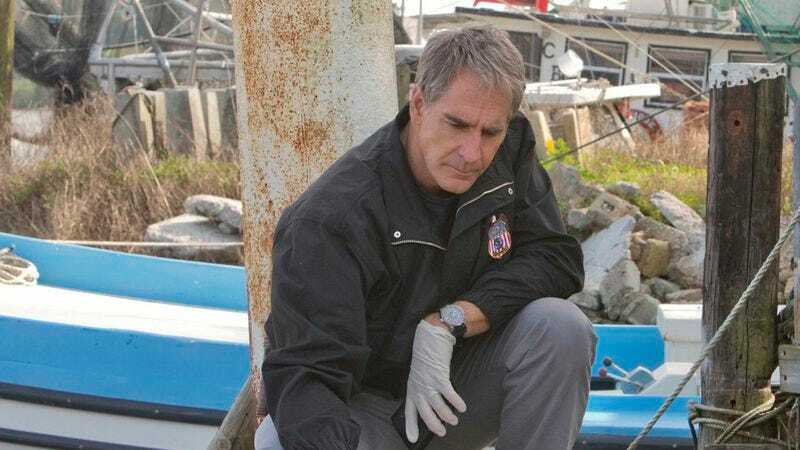 Currently, Bakula can be seen starring in the latest entry in CBS’s ever-popular NCIS franchise, NCIS: New Orleans. Scott Bakula: Who is this guy? He’s kind of bigger than life. He’s based on a real, live person who’s still alive and is our technical advisor… and, ultimately, he becomes my own personal technical advisor. [Laughs.] He’s from New Orleans, he was on the police force for years, the NCIS office down there for 20 years, and he’s semi-retired until a good case comes along. If one of his buddies calls him, he goes and helps still. He almost cares about the city more than his family. My character’s relationship is suffering because between his work and his wife working… they’re separated. But he loves everything New Orleans. He loves the food, the music, the people, and the nature of the city, which is survival at any rate. He has a loyalty to the city. He’s somebody that, if you’ve got to get dirty, if you have to get on the ground and get under a truck, he doesn’t tell somebody to do it. He does it himself. He’s not a great rule follower. He tends to use what works. His line is a “his city, his way” kind of thing, and he’s happy to be away from D.C. and their prying eyes, so to speak, and the red tape and all of that stuff. So he’s somewhat of a rebel, which is kind of typical of folks from New Orleans. They all seem to have a little bit of a wild streak, and he’s the kind of guy who gets into trouble sometimes. But hopefully we’ll have an opportunity to spend time with him for awhile, and that’ll make him more and more interesting as time goes by. He’s probably got a few things in his closet that he doesn’t want everybody to know about, you know. [Laughs.] But, man, he loves the city. He loves the parades, he loves the tradition, he loves the history… He should be the ambassador of New Orleans. The A.V. Club: How much history did you have with New Orleans when you signed onto the series, and how much did you have to immerse yourself in the city? SB: I have a lot to do. I had very little history, oddly, given that I grew up in St. Louis, which is literally up the river. But I’d never been to New Orleans until a year and a half ago, when I shot a movie, Elsa & Fred, down there with Shirley MacLaine, Christopher Plummer, and Marcia Gay Harden. I’d had oysters from New Orleans. [Laughs.] My first oysters. When I was a kid, my friend’s dad brought them up after New Year’s Eve or something. He showed up and I was like, “Uh, what?” “Oh, you guys have got to try these oysters!” And I’ve been hooked on oysters ever since, so I’ve always associate New Orleans with oysters. But in the course of a year and a couple of months, I’ve had two jobs in New Orleans, so I feel like there was writing on the wall somewhere that I was destined to finally get some serious time down there. So we’re living in it, we’re gonna be fighting the heat and the bugs and the crocs. [Laughs.] And the drunks and the craziness. It’s a party down there, but it’s also a very complicated city. I hope we can explore it from a lot of angles and really bring out the kinds of people that live there, why they live there, and how they exist and survive. AVC: You did a lot of work in the theater before you ever got in front of the camera, but the farthest back I could find with your on-camera work as a leading man seems to be a TV movie for Disney called I-Man. SB: Oh, my gosh. That was a crazy… [Starts to laugh.] I have so many memories about that, but the first memory is that it’s a job I got in New York, which you never get. When we were in New York and we’d go on tape for the west coast—that’s tape, in the old days—you’d go, like, “Yeah, it’s just not going to happen.” You never felt like you could get the job if you weren’t in the room with people… which is ironic, since 80 percent of the time now you’re not in the room with people. You’re being put on video and sent to them. But you just feel like you don’t have a chance, because you’re dealing with the casting person. And, you know, they’re trying so hard to get you the job, and they’re giving you advice and they want you to do well, but you can’t talk to the director, you can’t make adjustments… So I did this crazy audition back in New York, and I kissed it goodbye. But I grew up watching The Wonderful World Of Disney on Sunday nights, and that was iconic for me and my family, so when I got this call… [Sighs.] It was wild, because Corey Allen directed it, and Corey Allen is most famous for being in Rebel Without A Cause with James Dean, where they played chicken on the cliff. You know, when they’re driving, the bad guy [Buzz Gunderson]? That’s Corey Allen. So the whole thing was overwhelming, but first of all just because I got the job! I’d done a little bit of camera work back in New York, a little bit of soap opera work, but it was, like, a day on a soap opera, and then six months later another day. Mostly it was just theater, theater, theater. Although I did do a little cameo on a TV show called On Our Own, which was with Lynnie Green, Bess Armstrong, and Dixie Carter… and the first TV job I got when I got when I came to L.A.—or, rather, when I moved to L.A.—was for Designing Women. So there was almost a 10-year gap between them, but Dixie was in the first TV show I did in New York and the first TV show I did in L.A. I loved Dixie. I adored her and Hal [Holbrook]. From there, I got on a plane, and I go up to Vancouver—I’d never been to Canada before—and I’m on a set, and I’ve got to do all these things, like, “Okay, this is the scene where you get on the fence and you get electrocuted, so you’ve got to figure out how to die like you’re being electrocuted, and then you’ll come back to life. And this is where you’re dying because you’re not getting sunlight, so now you have to figure out some kind of death through no… chlorophyllication or whatever!” [Laughs.] But Corey Allen was just… He was my buddy. And he knew it was my first thing, and he was an actor first, so he was like, “I’m gonna get you through this. We’re just gonna figure this out.” I worked with Herschel Bernardi, who passed very soon after that, and with John Anderson, who was famous for playing Gabriel on The Twilight Zone and who was also from St. Louis, so he and I became fast friends. The whole experience was just surreal. I had to just say, “I don’t know anything!” We had an English D.P. [Frank Watts], and I said, “I don’t know anything about anything. You’ve just got to help me.” So off we went on this adventure, making this movie, and the next thing you know, Michael Eisner was introducing it one Sunday night on The Wonderful World Of Disney, which… I mean, that was great! AVC: You brought it up in passing, but how was the experience of doing Designing Women, being as it was your first TV gig in L.A.? SB: Unbelievable. It was great. But crazy! [Laughs.] And here’s a bit of full-circle for you: Annie [Potts]—I played her despicable ex-husband—is married to Jim Hayman and has been for years, and Jim is our producing director on NCIS: New Orleans. So they’re getting an apartment in New Orleans, and… it’s just a funny coming-around-full-circle thing with Annie. They brought me onto Designing Women several times over the years, which was great of them. And it was great getting to work with Dixie again and just to be a part of that show. The folks who ran that show, Linda Bloodworth-Thomason and Harry Thomason… Linda was from Missouri, which is where I’m from. It was right around when I did that show that I got my first indication of what life was in Hollywood. I was doing a play out here, a musical called Nite Club Confidential, and it was this great show. So I’d go on auditions, and they’d say, “Oh, Scott, it’s so nice to meet you!” and I’d say, “Oh, thanks!” And they’d go, “So, Nite Club Confidential!” And I’d be, like, “Oh, did you see it?” “Oh, no, no, we didn’t see it. But we heard it was great!” [Laughs.] And I realized, “Okay, I’m not in New York anymore, and this is a different world.” Either they’d heard that it was great or they’d read that it was great, and that’s why they were seeing me. Sylvie Drake wrote a great review, and all of a sudden I’m in all of these meetings, and I got the job on Designing Women. I just remember thinking, “Okay, so your work doesn’t actually have to be seen.” In New York, everybody goes to the theater, they see you, and they say, “Oh, I saw you, and you were unbelievable.” Here, they just have to have heard you were good. AVC: In addition to NCIS: New Orleans, you’ve also got a role on HBO’s Looking, which seems to still be ongoing. SB: It is still ongoing! Yeah, I’m going to be shooting a couple of episodes this month…on a Saturday! AVC: That’s your version of a break, is it? SB: [Laughs.] Yeah, I’m shooting them on my “vacation,” on a Saturday and a Sunday. AVC: You’ve done some work for HBO in the past, but how did you find your way onto Looking? SB: Well, Andrew [Haigh], who didn’t actually create it—Michael (Lannan) created it—but HBO brought Andrew on to run the show and become kind of the stylistic director of the show because they liked his sensibilities. Anyway, my understanding is that he’s with my manager’s company, so I don’t know how they got wind of it, but they called and said, “Andrew would like to have a meeting with you, and there’s this part on the show.” And obviously, because of [Behind The] Candelabra, I was on the minds of the folks of HBO, and that always helps in our business, to be more to the front of the brain than not being thought of. So we had breakfast. We sat for two hours and talked, and… he had nothing on the page to show me, but he just talked about this character and would I be interested in playing somebody like him? And they sent me the first hour that they’d already made, and they sent me his movie, Weekend, that he had made over in England a few years ago, and asked me to look at all of that. And I just really… he’s just a really great guy, and I think he’s really talented, and it just felt right. I trusted him, you know? Sometimes that’s all we have in this business. And he delivered: He wrote a great part, and I had just a blast being a part of it and being associated with the project and playing the role. AVC: You mentioned Behind The Candelabra, but your first experience working with Steven Soderbergh was on The Informant! That film isn’t among his best reviewed or his biggest box-office successes, but it seems destined to develop a cult following as time goes on. SB: I hope so! I loved it, and to this day I believe that Matt [Damon] should’ve been nominated for that. Not that that’s why we do this, but I just thought his work in it was extraordinary. It was a very difficult part, but he just became that guy. And it was a little scary sometimes, to be quite honest. [Laughs.] Just because of how good he was! He’d just start adlibbing in that stream-of-consciousness way. That character, in his illness, was just living constantly with that going on in his brain, and Matt just fell into it, getting to gain all the weight that he did. We just laughed so much. And I loved working with Steven. My friend Greg Jacobs, who was Steven’s producer on it, he kind of helped get me in there. It was a wild movie. We were in Decatur, Illinois, and I had a room with a huge hot tub in it, along with what I guess some people would call a pole. [Laughs.] It was wild. That’s all I can say. We kind of took over Decatur, Illinois for a few weeks, and we had a ball. I loved the outcome of that movie. I just think it was genius, the way Steven brought that eclectic cast together—all of those characters, from the Smothers Brothers on—and somehow made it all work. I’m in awe of that. AVC: Presumably your part in that film had a direct impact in you finding your way into Candelabra. SB: I think it was a combination of things. Part of it was Greg Jacobs, who I’ve known for years. His son and one of my sons are the same age and went to the same school together, but Greg and I were buddies who’d never worked together at that point. And it was also Carmen Cuba, who was casting it. They got the idea in their heads, and it was a great and, for me, unusual thing where I was doing a musical in San Diego. And I was driving back on the weekend, the phone rang, and my agent said, “Are you sitting down?” [Laughs.] It was one of those things. When I said I was driving, he said, “You might want to pull over,” and I said, “Well, I think I can handle whatever this is,” because I knew it was going to be some kind of good news. He said, “They want you to be in the new Soderbergh movie with Matt, and we didn’t want you to hear anything about it, but they’ve been working on it for a long time. Anyway, everybody said ‘yes,’ so you’re in!” It was a nice thing. And, coincidentally, my family was in the car with me, so we had one of those surreal show-business moments. AVC: So what was the extent of your Liberace knowledge at that point? SB: Well, I’m a piano player, so I’m a huge fan of his, but I had no prior… [Hesitates.] I knew about him as a famous entertainer and show-business man extraordinaire, but I didn’t know the details of his life. I knew that he had died from AIDS. But I grew up watching him play piano, and we’d never miss a Liberace appearance on The Tonight Show or on The Ed Sullivan Show. We were just fans. He was a consummate showman. But then I read Scott Thorson’s book, and then the script came, and… I certainly learned about Scott Thorson’s life with Liberace, anyway. And we had a ball bringing that to life. Well, I probably shouldn’t say it was a ball, because it was a tragedy. But we had a ball doing the fun stuff, and then the tragedy was the tragedy. AVC: Sibling Rivalry was your first film, correct? SB: Well, I was actually cut out of L.A. Story… and rightfully so. [Laughs.] But that was technically my first film. Then Carl Reiner came to my trailer when I was shooting Quantum Leap and asked me if I wanted to be in this movie with Kirstie [Alley], and I jumped at the chance. And that was another wild, eclectic group of actors: Carrie Fisher, Frances Sternhagen, Bill Pullman—people forget that he was in that movie—and, of course, Kirstie. There were lots and lots of people. But getting to work with Carl Reiner, I can’t even… It’s kind of indescribable. If you were to ask me, “Who do you want to work with in the business?” I’d say, “I don’t know,” because there’s so many people that I want to work with. But to have had that experience and time with Carl… I mean, he’s so funny, he’s so kind, and he was so organized and civilized. We wrapped at five o’clock, he went home to have dinner with his wife, and that was the way the work day went, you know? There wasn’t anything like, “Oh, we’re waiting for the perfect light.” It was, “Okay, it’s five, we’re done.” Friday afternoon, there’d be a band on stage, and they’d have sushi and Coronas out, so that as people were wrapping up they could finish the week with food and a beer. It was just great. AVC: Okay, I know I’ve got this one right: Gung Ho was your first time as a series regular. SB: Yes! In fact, I was actually talking about that yesterday. But that was from the movie Gung Ho, and it was an audition I thought I would never get because the producer, the whole time I was auditioning for it, was lying on a couch and he never got up. And I walked out of the room, I called my agent at the time, and I said, “Well, that’s that. The guy couldn’t have been less interested!” And, of course, I got the part, so when I went back in, I said, “What the heck, Mark? What was that all about?” He said, “My back was out. I was on meds!” So I said, “Well, in that case, I’d better stop asking questions and get out of here, because once you come off the meds, you might realize you hired the wrong guy!” [Laughs.] But that’s my memory, and it’s a strong one. And, of course, I got to work with all of these wonderful Japanese-American actors, and we laughed a lot. And Ron Howard was around. So it was quite a big start for me. And I was very confused about this whole thing about a camera and being on your mark, when I wanted to walk around like I was on a stage, whenever and wherever I wanted to. It was a huge learning curve for me. But they were patient. AVC: By the time you did Eisenhower And Lutz, did you feel more comfortable in front of the camera? SB: Oh, much more. I’d done Designing Women by then, and I’d done a bunch of guest appearances on other things. And, I mean, we shot nine episodes of Gung Ho, and just having nine weeks of scripts and understanding the system and how it works… I still felt confined by it, but then I got into this great situation with Allan Burns, who was so wonderful, and Pat Richardson, DeLane Matthews, and Henderson Forsythe. We just had a really great group, great actors, and we had this very creative experience. AVC: With either of those series, you obviously never know how these things are going to go, but were you surprised when they had their plugs pulled? SB: Not Gung Ho. We were on a Friday night, I think at 9:30 or something, and… it wasn’t a great time in the country for Japanese automakers. There was not a great feeling. The movie had done so well, but I think inviting that into your room in certain areas of the country every Friday night and looking at the Japanese auto workers taking over a plant in the United States… It just was a different time, and it meant a different thing to a lot of people. I’m not saying that the show was the greatest show that had ever been, either, but I had a blast making it. But Eisenhower And Lutz, we were on after Newhart, and I was very surprised. In fact, I did a Broadway show, and I told them, “Look, I’ve got this little window of time, but I’m relatively sure I’m going to be back making this half-hour show, so are you guys okay if I bail in August? Because I have this other commitment.” And they said, “Yeah, sure.” And, of course, it didn’t get picked up, so I was like, “Well, can I stay a little bit longer? Please?” [Laughs.] But two things happened: The show didn’t get picked up, and the Broadway show was a hit. The odds of that happening are pretty rare. But we were all shocked about not getting picked up. I can’t really remember why, because we were doing very well, but my memory is that it was something about how America wasn’t ready for a guy with two girlfriends. That was definitely some of the feedback. Basically, we didn’t quite fit in tonally with what was on the air on CBS at the time. AVC: Sam Beckett on Quantum Leap was a defining role for you, at least for television. SB: Certainly. You know, that show was about Don [Bellisario], and it was about Dean [Stockwell], but, really, it was about this incredible, creative group of people assembled there that made one-hour period movies every eight to 10 days. I always likened that show to running a marathon: You just tried to get through the season in one piece. It wasn’t about a sprint, but it was a little bit about survival. In four and a half seasons, I think there were five days that I wasn’t on the set. And for the rest of it, I was usually there for the first shot and the last shot. So it was a huge opportunity for me as an actor to think about things in a way I never would’ve thought. You don’t go to acting school or an acting class and say to a male in the class, “Okay, you’re playing like you’re about to give birth. Go!” [Laughs.] Or “you’re a female contestant in a beauty pageant in the 1950s!” You’re just outside of that, you know? But we just kind of went for it. We dressed it up and gave it a shot and tried to have a lot of heart and tell stories about people. But in the middle of it, we were still just scrambling like mad to make these shows. The detail and the amount of energy that went into making them correct onscreen was phenomenal. And we didn’t have any repeating sets. We didn’t have any standing sets. We had to go find 1954. That meant find all the cars, all the clothes, build or make all the sets, get all the right props… and now go find 1977! [Laughs.] And, man, every week, they just showed up. Don was ferocious about the detail. And that made the show pretty amazing, I think. AVC: Are there particular episodes that stick with you as favorites? SB: I always say the [Man Of] La Mancha episode (“Catch A Falling Star”), just because it had music, and I love that show. Allegorically it was perfect for our show. Don Quixote and Sancho Panza were a great connection to Dean and myself as Al and Sam. And then the “Leap Home” episode, and the Vietnam episode. The shock-therapy episode [“Shock Therapy”] was great for me as an actor, because I got to play all these different people that I’d leapt into. The list goes on. “Jimmy,” the episode about the young man with Down Syndrome. There were just tons of times that we got to do music and do different athletic things, like swinging from a trapeze. It was a constant challenge. But we got such great actors who came through and helped us…which was good, because I didn’t have a cast. I had one guy! [Laughs.] So I had a revolving door, and, oh, here come eight new actors every eight days, who I’ve never seen before or worked with before, and they’re now on the show. And I had to figure out how to make that work with them. So that was the other hugely challenging part. Every actor works differently, and our job is to make them as good as they can be when they’re there, because they make our show better, and you want to have a good experience. So it was very intense, but it was intensively creative and a positive experience. AVC: How did you feel about the series finale? SB: Um, well, without making it a long story, it’s one of the most challenging finales that I’ve ever been around, because we didn’t know we were being canceled. So Don wrote it so that it would kind of work if we were canceled, and if we came back the next year, he could find a way out of it. If we became a movie of the week or a revolving series—because back then they had Columbo and other things that were kind of revolving movie series that would show up a couple of times a year—or even if it was going to become a feature, there’d still be a possibility to do all of those things. Yet it still wrapped up the show. So if you watch it with that in your head, it’s phenomenal. SB: Oh, my gosh, yeah. It’s funny, my makeup artist on that is down here in New Orleans, so we’ve been talking about that a lot. By the end of that movie, I was in about three hours of makeup, by the time they did the tattoo and the burn and the cut and the blood and the dirt and the contact lenses. You know, it just went on and on. And I had to get there that much earlier as it went on to get ready for that day’s work. Clive Barker is just genius, and he’s incredibly gifted in so many different ways. He can write and direct and paint and do all these different things, and he can do them all extremely well. I was in awe just being around him. He was and is a sweetheart of a guy. But it was a very difficult shoot. Very, very difficult, and very challenging. But great performances from a bunch of people, and… that was another one that we kind of thought was going to become a series of movies, but it never happened. There was a second film script that came out, and we were talking about it, they were trying to decide who was going to direct it, and there were all kinds of things that were close to going, but then there were other things that happened with the studio, et cetera, and it never came to fruition. But it was a great experience, and I just love Clive Barker. AVC: He’s said many times that his director’s cut is the definitive version, not the theatrical release. AVC: You haven’t done a lot of voice work, but Cats Can’t Dance would seem to be the equivalent of your theater work in animated form. SB: Yeah. It was… different. It was a unique experience: I’d never done it before, and I haven’t done it since, at least not to that extent. I was attracted by the idea of the music and Randy Newman. I mean, that was really the big thing. And Randy Newman did not disappoint, let me just say that. [Laughs.] He’s such a creative guy and such a dry wit. We worked hard when we were in the studio to record the songs and to have all these different opinions coming together. And that was a job that never ended, because in the middle of it… I can’t remember whether Hanna-Barbera was bought, or they were bought by somebody else, so then you had a new bunch of executives who came in and said, “Oh, we want the couch over there.” Well, you’ve got to draw the couch over there, so four months later you come back and do the new scene with the furniture rearranged, or, you know, whatever it was. But it was supposed to be a one-time thing that was going to be over in a few months, and it went over a few years. And then, at the end of it, whoever bought it… I think Warner Bros. released it, but they didn’t have a horse in the race, so they just kind of said, “Well, sure, we’ll release it!” And it went out, but it never really got promoted. Or not in the way that movies should get promoted, and certainly not in the way that all of the other animated movies were being promoted at the time. So it kind of fell through the cracks, but I’m always bumping into people who absolutely love it, and I always get a huge kick out of it, because it’s different than a lot of other animated movies. There’s an adult-ness to it, and…well, anyway, it was a great cast, and my kids love it, and I’ve talked to other kids and parents who love it, too. And it was fun! SB: Working with Ray [Romano] and Andre [Braugher] was just kind of an exercise in improvisation and creativity. And Ray, you never knew what he was gonna say. So that was a challenge and a joy. I’d met Ray only once, and I’d never worked with Andre before, and I think the big joke of that series still for us is that everybody was scared to death that Andre wasn’t going to be funny. It was like, “Oh, you look at his Homicide work. He’s such a serious actor.” Could he be funny? Would it work? And they wrote him and played him, scene-wise, and then Andre just took it… and he just killed it! [Laughs.] And now he’s on Brooklyn Nine Nine! He’s a great actor, and that was not a revelation to me, but it’s always interesting how people pigeonhole you as an actor. And then the flip side of it was that Ray is a wonderful serious actor, and he delighted in succeeding at that. And that was a revelation, I think, for a lot of people at how great Ray was at some serious moments. He wrote them, and he leaned into them—he wasn’t afraid of them at all—and he wanted them to be right. He was also a very good producer. He was writing, producing, and starring in it, and he handled it. I was very impressed. AVC: How was it for you to play the character of Terry? SB: Oh, it was a blast. It was just a blast. And, you know, they let me do a lot of really fun stuff. I was so looking forward to the show continuing, because I just felt like Terry had so much opportunity to grow and to screw up. [Laughs.] And have wacky relationships, and be immature, and to try and grow again. It was that kind of a character where I thought, “Man, I could do this for a while! He is messed up!” And those are the best characters, because hardly anything is wrong. It’s like, “Man, from one messed-up guy to another…” And I developed a tremendous relationship with the folks at TNT, and I really grew to appreciate them. It was fun when we won the Peabody, and there were some nice things that happened along with that show that I was glad to be a part of. That time with TNT was very uniquely intimate for the actors and the network. It was great. AVC: We’re in the home stretch, time-wise, so do you want to flip a coin to decide which sports comedy we talk about? SB: Oh, man, you mean I have to choose between Necessary Roughness or Major League [Back To The Minors]? [Laughs.] Well, Necessary Roughness was in the middle of Quantum Leap days, so I was fitting that in on a hiatus, and…well, it’s a hiatus, so you’ve got to do something. I don’t know exactly how it all worked out, but Paramount didn’t want me, they still didn’t want me, then they couldn’t decide if they wanted me, so they passed on me, but then they made a deal. I was shooting Quantum Leap during the day, and I was throwing footballs between the soundstages at Paramount at night so they could film that and could see if I looked like a quarterback…and then they said, “Never mind!” Then they had to call back, and I don’t know what the whole story was, whether they couldn’t get who they wanted or they decided that I was the guy, but we had to renegotiate a whole other deal. But it was wacky. Jason Bateman was it, which a lot of people forget, and Sinbad and [Robert] Loggia and Hector Elizondo. My friends wrote it… or, rather, they weren’t my friends at the time, but they became my friends, and they’re still my dear friends. Dave Fuller and Rick Natkin. And, God, it was another case in my interesting and ongoing relationship with Paramount. That was Gung Ho, and that was Enterprise, and…yeah, I’ve had a long, storied, up-and-down relationship with Paramount. But I have to say, I had a ball on that… kind of. AVC: I know you’ve got to go, but we’ll never hear the end of it if I don’t ask about Enterprise. What were your feelings of the evolution of the show over the course of its run? SB: Well, that’s not a short answer! [Laughs.] There is no short answer there. But it was a great experience for me, and I was grateful to be a part of that franchise. People always ask, “Did you know you were gonna grow up and be the captain of the Enterprise?” And I say, “No, I had no idea.” I was a fan of the original Star Trek when I was growing up, but I never would’ve believed that I would’ve grown up to be a starship captain, much less meet and become friends with Bill [Shatner] and Patrick [Stewart] and all the other captains. The community, the outreach of the planet, is kind of unfathomable. I just got together with all the guys in Las Vegas for a convention a few weeks ago, and we laughed a lot. We worked with some of the most creative people in our business, pioneers, from Michael Westmore to Robert Blackman, and Herman [Zimmerman], our art director… To be a part of what they were doing on television and in the industry, and what they were able to do with all of the technical stuff… We were working with some of the most brilliant minds in the business, and who’ve been in the business for a long time. And when I heard it was 100 years before Kirk and Spock, I was just like, “Okay, I’m in.” I didn’t want to follow anyone else—I felt like there was no following them—but being first? I was okay with that.